Make Change provides a toolbox of mental tools and practice opportunities for making change. Proposing that social and environmental sustainability should be the core drivers, rather than additional component of all creative endeavors, make change helps you craft intended and integrity base interventions into existing systems, to empower and enact positive would changing outsources through the things that you do. Whatever the type of change you’re interested in - social, cultural, political, personal, or environmental – (all change should be both sustainable and creative – right…?) the ideas contained within this handbook are for you. There are a few key ingredients needed in order to understand and successfully effect change – starting with the important act of getting your head around the cognitive, cultural and social conditions that both resist and allow for change to happen. 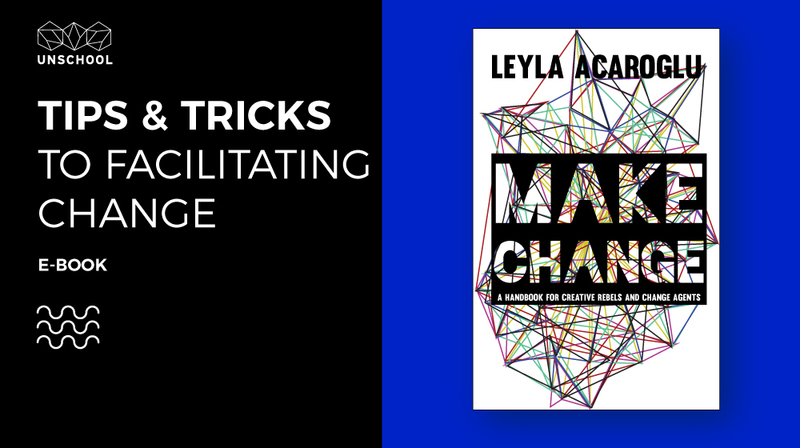 Over the following pages you will discover a range of approaches from Psychology, the behavioral sciences, economics, business, and sociology that combine to provide an overarching context for change. The one constant thing in life is change! There exists a limitless universal flux where everything is shifting and evolving around us, including us - meaning that change can be elusive and hard to pin down. But make no mistake, we can and do already all affect change in the things we do. Every action, intended or otherwise, participates in the formation of ourselves, of other people, and the way we interact with the world around us – we are literally making the world up as we go along. Designers design change. Business influences change. People change each other. Basically, change is everywhere, ever present and constant, whether we know it or not. This handbook is a proactive approach to encouraging the direction of creative power and influence in a way that generates positive social, environmental and cultural change. This e-book is the first in a series of handbooks on how to make a positive impact on the world by design.